That wouldn’t happen with a DEMOCRAT, would it? Look at how well President Clinton was liked by women… Oh, right. Bad example. Well, it wouldn’t be an outspoken far-Leftist blowhard, would it? It’s New York Mayor, Bill de Blasio. 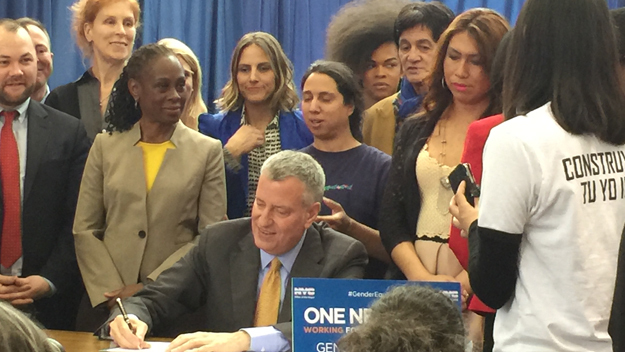 Here is a photo of de Blasio championing one of those progressive bathroom bils. Look how thrilled the women around him are to have men taking dumps in the bathrooms and hanging out in the changerooms with them. Where men are women and treated with the special status that women get due to their gender identity, because ‘gender is a social construct’ so men can be women. But it turns out that this ‘champion of women’ isn’t so friendly to women in the office. We’re not sure how the men that identify as women are handling the situation because no one asked them. After all, this is an article about women, not men. But the men that identify as women are still women even though they weren’t asked, because ‘gender is a social construct’. But we do want to make it clear that this article is about women that identify as women, not men. Because otherwise, it would be sexist. The weird thing is — the number of women that were leaving in such a short period of time that The New York Times even noticed. What’s more, the newspaper that recently changed their slogan to: ‘The truth is more important now than ever‘ from ‘All the News That’s Fit to Print — But Some Of It We Just Made Up‘, decided to actually look into why the women were fleeing the de Blasio office like rats on a sinking ship. But some found the work environment at City Hall directly hostile to women. “I just found it to be a totally inhospitable workplace,” said Lindsay Scola, Mr. de Blasio’s former scheduler, who had previously worked with the former first lady, Michelle Obama, and the Energy Department. Look at that. Character matters. And it’s revealed in your everyday life, not just in stumping speeches. So, men that are making workplaces hostile for women are a problem? Wow. Somebody should tell the staunch feminist, Bill de Blasio.